Three Butterick patterns for girls 8 to 15 years old, Delineator, April 1921, page 38. Three Butterick patterns for girls 8 to 15 years old, Delineator, April 1929, page 39. The legs look coltish, (as they did in 1960’s illustrations…) but the bodies have credible proportions. The daytime styles we think of as quintessentially “nineteen twenties” have kneecap length skirts, dropped waists, a sporty air, and proportions that look pleasant on an actual female body. 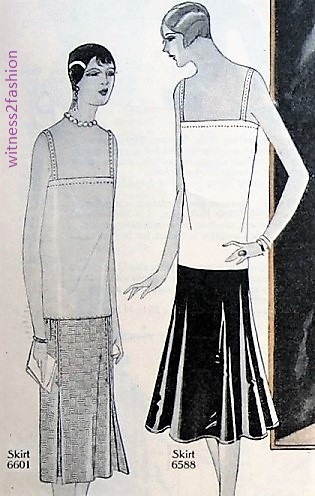 The elongated fashion illustrations of the Twenties are hard to imagine on a normal young woman — but these illustrations of teens look “just right” to me. 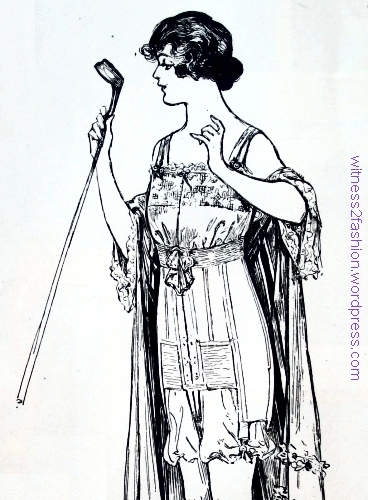 A suit (dress plus matching coat), a dress, and a suit made up of suspender skirt with attached blouse, and jacket. Delineator, April 1929. Only the suspender skirt (right) is a style not worn by older women. The dress in the center looks girlish in comparison to its neighbors. On the other hand, that’s a lot of eye makeup! Delineator, April 1929, page 39. Butterick 2427 has nothing childish about it. A long tie in back is purely decorative, but flatters the figure. The sleeve/armhole treatment is very 1920s, and the swooping curve of the yoke, balanced by a curve on the skirt yoke, is elegant and sophisticated. If you were copying these designs for an adult, a small bust dart — or two — in each side seam would be a good idea — and common in women’s patterns from the later 1920s. Butterick 2574 has a suspender skirt. They were worn by young adults, but not by matronly types. 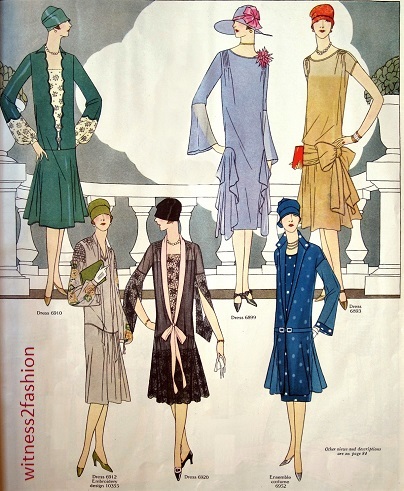 Butterick 2485 owes a lot to Chanel; her jersey suits and cardigan sweaters were a major influence on the acceptance of casual chic. Butterick 2507 uses fagoting — a nod to Vionnet — in a simple shift. I think it would look better without the embroidery. In spite of those tucks over the breast, I’m not sure this one would be flattering to a grown woman. Crisp and made dynamic by plaid on the bias in the top of the dress and pocket. Butterick 2558, for girls 8 to 15, Delineator, April 1921, page 39. A long-sleeved version was also possible; and of course, the plaid is zingy, but not required. This dress could be monochromatic, or made with a white or cream top and a dark skirt and trim, or in two shades — or two textures — of the same color, for a dressy look. I can’t imagine many pre-teens getting away with the amount of mascara illustrated, but…. Actress Phyllis Haver in an ad for Maybelline Mascara, Delineator, April 1929, pg 107. Blame it on the movies. Advertisers didn’t have photo doctoring programs in the Twenties, but they still managed to doctor photos…. A little exaggeration in an ad for Maybelline Mascara, 1929. Fingernail polish in an illustration from 1931. The tips and “half moons” remain white. 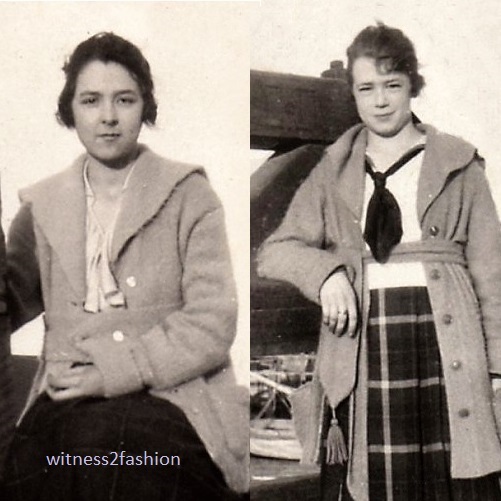 This was the fashion during the 1920’s and the 1930’s. Delineator, November 1931. The artist was Dhynevor Rhys. By 1931, the liquid product we call “nail polish” was widely available, but there was an earlier way to shine your fingernails: nail polish powder. It persisted into the 1920’s. From an ad for Cutex nail powder and polishes, Delineator, November 1924. Back in the 1940s, my mother still had her old celluloid dresser set, (not as nice as that one!) which included — in addition to a hair brush and a mirror — a button hook, a hair receiver, a container for collar studs, a file, and a nail buffer. She showed me, once, how to put the polish, which came in a small jar, on my bare fingernails and then buff them to a soft shine with a chamois nail buffer. Using a nail buffer; illustration from an article on nail care, Delineator, July 1924, p. 37. “Now when the child of morning, rosy-fingered Dawn, appeared, Nestor left his couch and took his seat on the benches of white and polished marble that stood in front of his house. [Odyssey]” Thanks to Gary Corby. From an ad for Cutex nail polish, Ladies’ Home Journal, October 1917. Cutex Nail Polish ad, 1917. Ladies’ Home Journal, October 1917. The range of Cutex products in a sampler set from 1917 included “the ideal cuticle remover,” an emery board for shaping the nails, an orange stick for cleaning under nails and pushing back the cuticle, a ball of cotton, nail white, “polishing paste pink” and a bar [or is it a box?] of polish. Cutex manicure products, 1917. This sampler kit “sent for 14 cents” includes two forms of polish, nail white, cuticle remover, “Cuticle Comfort” moisturizer, and basic tools. Ad from LHJ, October 1917. There is an excellent history of the Cutex company, which was founded by Northam Warren, complete with product descriptions and early advertising: click here. The Cutex company’s initial product was a liquid for softening and minimizing cuticles without cutting them: Cuticle-“X,” became the “Cutex” brand. Applying Cutex nail white, from a 1917 advertisement. “A touch of Cutex Nail White underneath the nails leaves them immaculate — snowy white.” Later, Nail White came in a tube, making it easier to apply. This is an ancestor of the “French Manicure” popular at the end of the 2oth century. The twenties’ ideal was almond nails with white half moons and tips; from an ad for Cutex, November 1927; Delineator. Colored polish was not applied to the tip or the base of the nail. Half moons and lovely oval fingernails. Cutex ad, April 1928. Delineator. The “ideal nail shape” changed to sharply pointed nails in the nineteen thirties, but the half moons and tips remained white. According to several sources, clear liquid nail polish was available in 1916, and Cutex sold a clear liquid polish, tinted “natural” pink, after 1920, but in this Cutex ad from 1924, Cutex Liquid Polish which “lasts a whole week” is just one option among the older buffing products like powder polish, cake polish, and paste polish. An introductory set: Cutex powder polish and liquid polish plus cuticle remover and cuticle cream. Ad in Delineator, October 1924. Full sizes cost 35 cents each. Throughout the nineteen twenties, liquid polish gained popularity. The “sophisticated Parisienne” applies Cutex Liquid Nail Polish in this ad from November, 1926. Delineator. The brush is now part of the bottle cap. Cutex packaging was changing, too. A sample of Cutex liquid nail polish in a bottle with separate brush. Ad from November 1926. “In two shades, “Natural or the New Deep Rose.” A bottle of nail polish remover was included. By 1928, Cutex ad campaigns featured celebrities like Anita Loos. Anita Loos appeared in an ad for Cutex liquid nail polish in 1928. Illustrator and industrial designer Helen Dryden praised liquid Cutex nail polish. 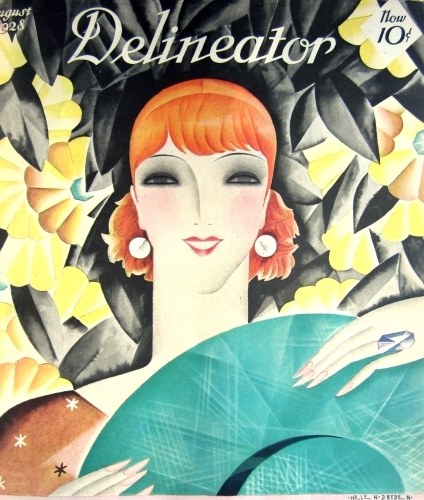 Fashion Illustrator Helen Dryden illustrated many magazine covers for Delineator. Cutex ad, 1928. So did this “lady explorer” (Osa Johnson) on a zebra…. Cutex ad, January 1929, Delineator. Cutex liquid nail polish was advertised as nail protection in the late 1920’s. Cutex Liquid Nail Polish and Nail Polish Remover. 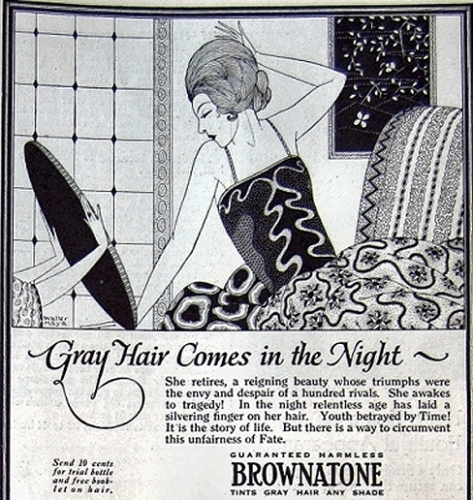 January 1929 advertisement. This introductory offer included both for 6 cents, but normal sized bottles cost 35 cents each. Incredibly, it seems that liquid nail polish was sold in the 1910’s before nail polish remover appeared, but in this 1929 introductory package, they are offered together. The ideal fingernail was not overly long in the 1920s — and nail polish did not cover the “half-moon” or the tips of the nails. Cutex ad, Delineator, June 1928. Elegant hands wear colored nail polish on a Delineator cover, February 1932. Dynevor Rhys illustration. As liquid nail polish became available in a range of bright colors, Cutex had to convince women to wear them. There was an ad campaign stressing that respectable socialites and debutantes wore colored nail polish. Presumably, conservative women thought red nails were the sign of a scarlet woman, and had to be persuaded otherwise. 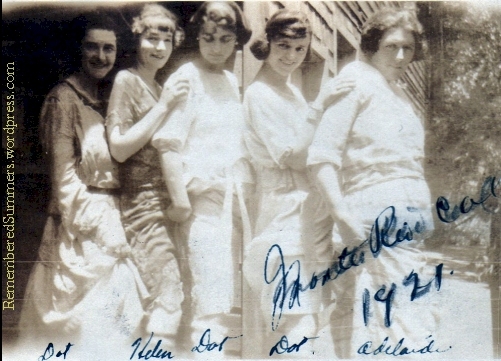 Debutantes were encouraged to wear colored nail polish — and sharply pointed nails. Cutex ad, Delineator, February 1932. Applying polish to just part of the nail is definitely more difficult than painting the entire nail, but fashion is rarely practical…. Pointed nails shaped like claws appeared in the early 1930’s. The picture of innocence? Strawberry soda and very sharp fingernails painted to match. Delineator cover, July 1933. Dynevor Rhys illustration. If respectable women were going to have bright red fingernails, they needed to be taught how to coordinate their nail polish with their clothing. Three highly respectable socialites wear brightly colored nail polish. From left, ruby red nails with a black outfit, rose nails with a green dress and silver fox fur, and coral nails with a beige dress. Cutex ad, February 1933, Delineator. Cutex advertised six nail polish colors in February 1933. Delineator. 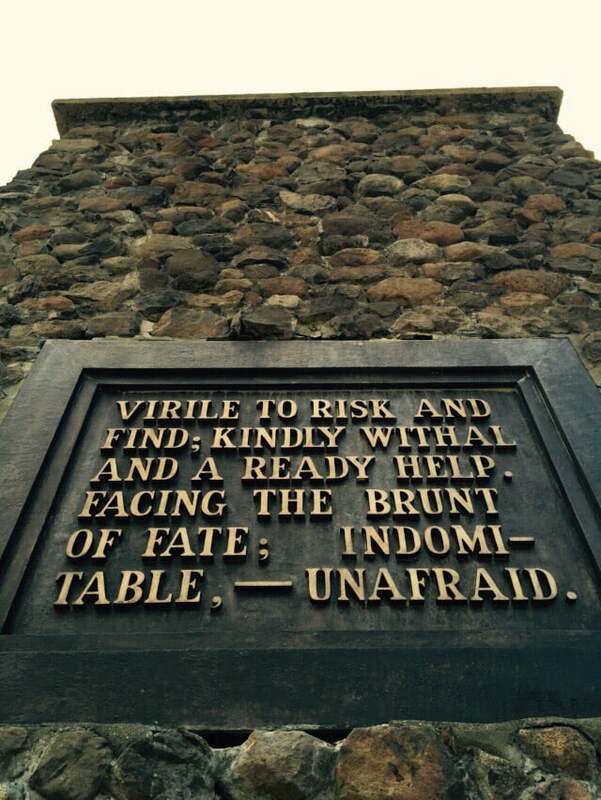 A woman had to have several choices so she wouldn’t “commit Atrocities” with clashing colors. “If there’s any dress in your closet that hasn’t its special shade of polish to snap it up, go get it!” That should increase sales…. Ad for Glazo liquid nail polish, Delineator, February 1934. At 25 cents, Glazo was much cheaper than 35 cent Cutex, which made it easier to own several colors. Women also needed more nail polish in the nineteen thirties, because they were encouraged to paint their toenails, too. A “manicure” included matching polished toenails in this beauty advice article from July 1934. Delineator, p. 37. The new, open-toed sandals for day or evening showed off twinkling toes. Right, evening sandals, June 1934, Delineator. The sandals pictured below are for daytime wear, but not necessarily on the beach. Daytime sandals described in Delineator fashion article, June 1934. 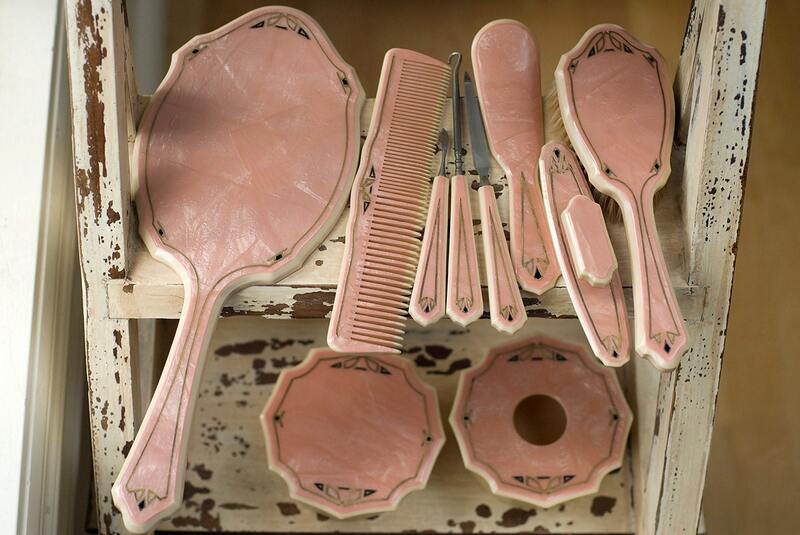 EXTRAS: You can still buy a nail buffer and polishing cream at Vermont Country Store. There is a History of Cutex with color ads at the Chronically Vintage blog, and an authoritative history of Cutex with color ads and images of products 1920, etc. at the Northam Warren (Cutex) site.